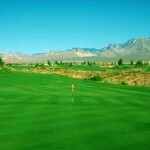 Billed as the “World’s Most Complete Golf Experience” Angel Park features two championship courses (the Mountain and the Palm), the Cloud-9 Par-3 course, a lighted putting course, complete practice facilities, and a beautiful clubhouse overlooking it all! 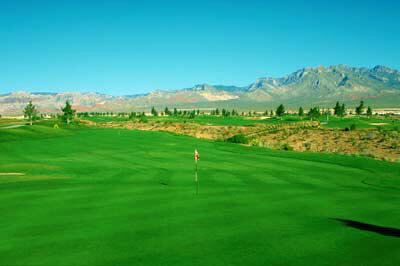 The Mountain Course, which is the more demanding of the two, provides players with a difficult, yet fair, test of golf. 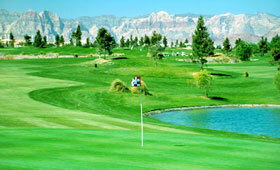 This desert style course provides beautiful views of the Spring Mountains and the beautiful Red Rock Canyon area. The course features generous landing areas and large greens, but natural desert ravines run throughout the golf course and help to keep players on their toes at all times throughout their round. As with most golf courses on the western side of the valley, a familiarity with the greens is needed to score well, as the grain of the greens can sometimes puzzle even the best players so don’t be afraid to ask the starter for some tips before teeing off! 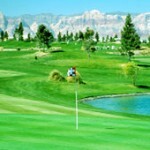 Book Angel Park Golf Club – Mountain Course Now!